This is our most far-reaching polar expedition and includes visits to three different locations. The sub-Antarctic Falkland Islands and the island of South Georgia are home to a proliferation of unique wildlife and birdlife. There are penguin rookeries with more than 100,000 nesting birds and the beaches are covered in fur seals and elephant seals. Seabirds, including many of the albatross species call these islands home, nesting and raising their young in this wild and remote environment. Both locations feature a fascinating history and stunning scenery. IMPORTANT NOTE: This itinerary includes a complimentary post-voyage hotel night in Punta Arenas for all guests returning from voyages that conclude at King George Island. 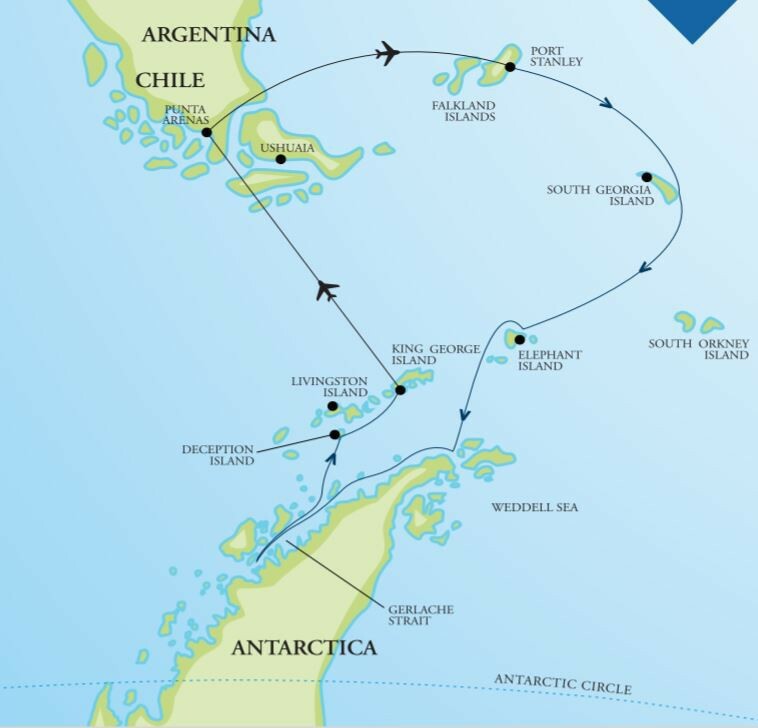 It also includes scheduled flight from Punta Arenas to Stanley (Falkland Islands) and charter flight from King George Island (Antarctica) back to Punta Arenas (Chile). Located on Deck 3 these cabins have bunk beds and a sofa bed. Facilities are shared. There is a washbasin with cold/hot water in the cabin, a writing desk/chair and ample storage space. All cabins have a porthole. Overnight we have navigated down the eastern coast of the Falkland Islands. Approaching Sea Lion Island, we first note the very barren and windswept landscape, exposed to the prevailing weather that originates in the Drake Passage. We launch the Zodiacs and go ashore to view the incredible diversity of wildlife found at this location. Three species of penguin including gentoo, magellanic and rockhopper, as well as southern elephant seals and South American sea lions are known to inhabit the area. King cormorants and striated caracaras are just some of the bird species we expect to see. Weather permitting, we may have time to visit neighboring Bleaker Island - another settlement on the exposed southeastern coast of the Falklands - equally rich in wildlife. Weather and ice will dictate our crossing of the Scotia Sea from South Georgia to Antarctica. As with all of our itinerary planning, our Expedition Leader and Captain will make a decision based on the sea and ice conditions at the time. The South Orkney Island group represent the peaks of a submarine mountain range called the Scotia Arc, connecting South Georgia to the South Shetland Islands. Often shrouded in fog and surrounded by ice much of the year, a chance to visit these islands doesn’t come often. As we edge ever closer to the frozen continent, large icebergs announce our arrival in Antarctic waters. If conditions allow, we hope to see the dark cliffs of Elephant Island appear on the horizon. Shackleton and his men were encamped here for many months, having lost HMS Endurance in the thick sea ice, far to the south in the Weddell Sea in 1915. From the tiny beach at Point Wild, Shackleton and six companions set off on the rescue mission to South Georgia, aboard the tiny lifeboat, James Caird. To this day, the epic ocean crossing is considered one of the greatest in history. If conditions allow, we will attempt a landing at Point Wild on Elephant Island. Around 60 miles off the coast of the Antarctic mainland we find the South Shetland Island chain. Possible landing sites could include King George Island, Half Moon Island or Yankee Harbour. Weather conditions permitting we sail the ship into the flooded volcanic caldera of Deception Island. There are some outstanding hikes at these locations and the old whaling station and aircraft hangar at Deception Island beg for further exploration. After so much anticipation, we enter the icy waters of the Antarctic Peninsula in the vicinity of Mikkelson Harbour or Cierva Cove. Snow covered mountains soar from the dark waters. Along the shoreline in the bays and harbors of the Peninsula lives an incredible abundance of wildlife. Large rookeries are home to chinstrap, gentoo and Adelie penguins. Seals live on the ice floes, including the powerful leopard seal that we hope to encounter. Gulls, skuas and cormorants are also found nesting and feeding at many sites along the Antarctic Peninsula. We explore by Zodiac boat and on shore where a range of exciting activities await. Locations we hope to visit include Wilhelmina Bay, Orne Harbour, Cuverville Island and the Errera Channel. Join the photographic guide taking pictures of stunning icebergs. Or enjoy a hike to the top of a snowy mountain saddle with one of our adventure guides. If the opportunity presents itself, visit a science base or an old historic hut. The sea kayakers may paddle up to several miles from the ship, offering a truly memorable experience. As our voyage comes to an end we chart a course for King George Island. Tonight we celebrate our voyage with a special dinner attended by the Captain of the ship. This morning we say goodbye to our expedition team and transfer ashore by Zodiac. We walk from the shore landing site past the Chilean research station and up towards the airstrip where we board our special charter flight. This flight takes a little over two hours and is included in the price of your voyage. Upon arrival into Punta Arenas a transfer from the airport into town is provided. IMPORTANT NOTE: This itinerary includes a complimentary post-voyage hotel night in Punta Arenas for all guests returning from voyages that conclude at King George Island. This evening is at your leisure. Punta Arenas is home to some cozy restaurants, cafes and bars – including the historic ‘Shackleton Bar’ at the Hotel Jose Nogueira – a fitting location to reflect on your journey to Antarctica.